The park/neutral position switch assembly detects the shift lever position and sends signals to the ECM. C. All switches are off simultaneously for NSW, P, R, N and D.
These DTCs indicate a problem with the park/neutral position switch assembly and the wire harness in the park/neutral position switch circuit. The park/neutral position switch assembly detects the shift lever position and sends a signal to the ECM. 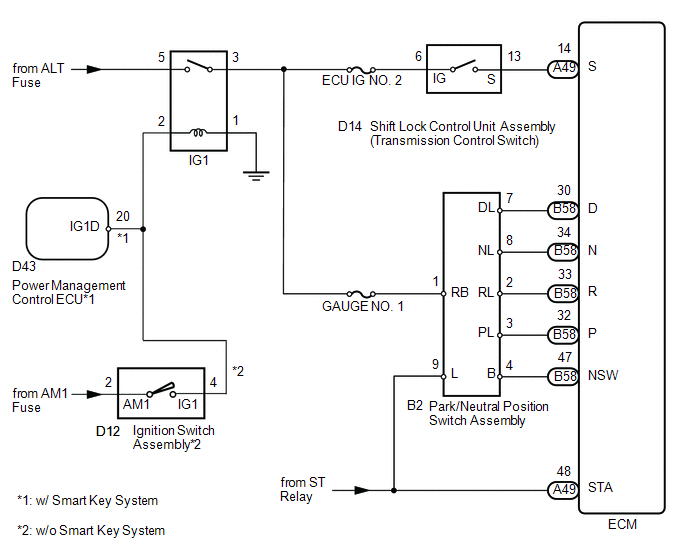 For security, the park/neutral position switch assembly detects the shift lever position so that the engine can be started only when the shift lever is in P or N.
The park/neutral position switch assembly sends a signal to the ECM according to the shift lever position (P, R, N, D, or S). The ECM determines that there is a problem with the switch or related parts if it receives more than 1 position signal simultaneously. The ECM will turn on the MIL and store the DTC. Move the shift lever to R and wait 2 seconds or more. Move the shift lever to N and wait 2 seconds or more. Move the shift lever to D and wait 2 seconds or more. Move the shift lever to S and wait 2 seconds or more. Move the shift lever to P and wait 2 seconds or more. Wait 1 minute or more. Using the Techstream to read the Data List allows the values or states of switches, sensors, actuators and other items to be read without removing any parts. This non-intrusive inspection can be very useful because intermittent conditions or signals may by discovered before parts or wiring is disturbed. Reading the Data List information early in troubleshooting is one way to save diagnostic time. (f) Enter the following menus: Powertrain / Engine / Data List. (g) Read the values displayed on the Techstream. (d) Enter the following menus: Powertrain / Engine / Data List. 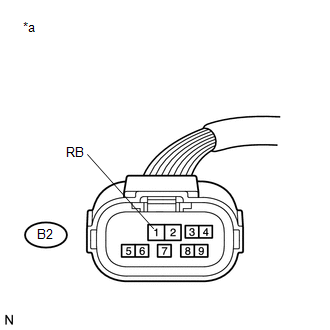 (d) Enter the following menus: Powertrain / Engine / Data List / Sports Mode Selection SW.
(a) Disconnect the park/neutral position switch assembly connector.